PROFESSIONAL DEVELOPMENT COURSES (101 Courses) - Included with your Membership! In response to a very important need by school districts, agencies and private schools for better trained, more informed, more qualified, and more knowledgeable teachers. NASET is proud to offer its members free access to over 100 comprehensive Professional Development Courses. NASET's WEEK in REVIEW is a weekly emailed publication that provides members with some of the most interesting stories, topics and issues reported during the week in the field of special education. All members of The National Association of Special Education Teachers, (NASET) have free access to an online peer reviewed research journal in special education, the Journal of the American Academy of Special Education Professionals (JAASEP). 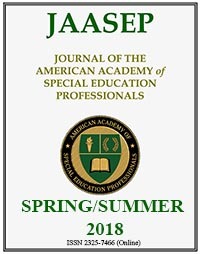 The Journal of the American Academy of Special Education Professionals (JAASEP) is an online peer-reviewed journal committed to advancing the professional development of special education professionals through research, policy, and practice. JAASEP is a multi-faceted electronic journal that seeks new contributions based on original work of practitioners and researchers with specific focus on or implications for the field of special education. This list is provided to all members of NASET to help facilitate the numerous tasks required on a daily basis. All documents are available to view online or download as a PDF file for offline printing. The online NASET Special Educator e-Journal is published throughout the school year, and provides timely information on what's current in special education. In order to keep up to date with the most current information in the field of special education, NASET provides its members with an e-Journal monthly. The 9 part series of Discipline of Students in Special Education is presented each month so that you can find IDEA's requirements in specific disciplinary areas. The case study at the end looks at how IDEA's discipline procedures apply in a real-life situation. This is a monthly education resource that will focus on the process used to determine a child’s specific learning strengths and needs, and to determine whether or not a child is eligible for special education services. . Assessment in special education is a process that involves collecting information about a student for the purpose of making decisions. Assessment, also known as evaluation, can be seen as a problem-solving process. This Series is devoted to lesser known disorders that you may encounter in special education. While not as prevalent as other disorders experienced by most special education teachers, you should be aware of these disorders in order to become more knowledgeable, and increase your ability to assist patents of children with these disorders if they should appear in your classroom or school. Each month we will present a list of 3 disorders that appear in the special education population. Some of these disorders may contain subtypes which will also be presented. You will also notice that each disorder has a code. These codes represent the coding system for all disabilities and disorders listed in the Educator's Diagnostic Manual (EDM) Wiley Publications. The NASET LD Report is an e-publication on the latest information on learning disabilities. Individuals with learning disabilities represent approximately 50% of all students receiving special education services. Therefore, it is inevitable that special education professionals will be working with students with LD throughout their entire careers. The NASET LD Report is a completed series and all issues are available for NASET members with a comprehensive overview of learning disabilities. The Practical Teacher is a monthly education resource that provides NASET members with practical tools, strategies, and relevant information that they can use both in and outside of the classroom. It is sent directly to our members to their email accounts, so that they have immediate access to it. PDF file version of each issue can be found at the end of the article. NASET provides for its members a variety of parent teacher conference handouts to view online or download. The Parent Teacher Conference Handouts are e-publications provided throughout the school year on a monthly basis. These handouts, on a variety of topics, are extremely useful and practical for all parents of children with special needs. The handouts can be given at the end of parent teacher conferences to reinforce concepts and help parents further understand information discussed at the conference. The NASET Behavior Management Series, is a series (completed) on the latest information on behavior management for students. The NASET Behavior Management Series is an education resource that provides members with the latest information for special education professionals on why students do what they do and what to do when they do it. It offers insight into the inner dynamics, conflicts, fears, symptoms, and tensions of students who may be experiencing behavioral difficulties in the classroom. The goal of the NASET Behavior Management Series is to help educators toward a greater understanding of issues pertaining to the psychology of children in the classroom. In the monthly e-Publication, Resolving Disputes with Parents Series you'll find authoritative information about critical aspects of resolving conflicts under IDEA. answers from experts in the field on the questions addressed. At NASET, we get many questions from our members about certain areas of interest. The NASET Q & A Corner provides all members with the opportunities to have access to these questions, and more importantly, answers to them from professionals in the field. This series of articles provides teachers with practical guidelines covering a variety of topics and supportive information which may help improve their classroom. There are a variety of settings in which teachers may be hired in the field of special education, including a resource room, self contained special class or an inclusion setting. We feel that it is critical for teachers working with special needs to have a real grasp on what is involved in creating the most ideal and practical classroom for their students with special needs. The Classroom Management Series focus is on topics for both new and experienced teachers, including topics on setting up your classroom, behavioral management, adapting curriculum, working with different personality styles of students, assisting parents of children with special needs, and many more relevant topics. 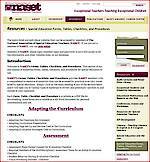 The NASET RTI Roundtable is an e-publication on the latest information on Response to Intervention (RTI). RTI is a newly-identified process described in the federal special education law (IDEA 2004) for identifying students with learning disabilities. 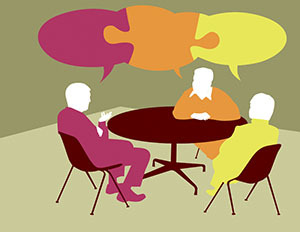 The NASET RTI Roundtable is a completed series that provides members with the latest information on RTI. The Genetics in Special Education Series is e-publication that provide infomration about selected genetic, orphan and rare diseases. Each month NASET will present 2 such disorders in this series. We hope you find them informative. The climate and quality of a school and the success of its students is greatly affected by the relationships among the adults who work in and operate the school. This idea is the basis of NASET’s Working with Paraprofessionals in Your School. The series was developed to provide teachers, related service personnel, administrators, paraprofessionals, parents, and other individuals charged with assisting in the development of the paraprofessional workforce with information and strategies to build strong, effective, supportive teams to ensure successful educational services for all students. Membership in NASET provides you with access to one of the country's most comprehensive and conveniently organized databases on Exceptional Students and Disability Information. Twenty categories under each disability provide an extensive overview of useful and practical resources to assist you on a daily basis. As a professional of special education, professor at a college or university, or a graduate student in the field, it is imperative that you have the ability to gain access to any new changes in the laws that govern your work. At NASET, we provide all members with an extensive and comprehensive site that covers the most up-to-date information on special education and the law. You will have access to The Career Center, which provides members with the ability to view current job placements in special education posted by employers throughout the country, career advice, career book resources, career fact sheets, access to databases for teacher salaries by state, and state licensure information. As a member of NASET you will have access to print or download a professional membership certificate recognizing your participation in the National Association of Special Education Teachers. Coming soon - online access to a membership card and paid membership invoice. The membership certificate will proudly show your participation in a professional association created specifically for special education teachers. You will have the availability of an extensive professional reference library, where you can access daily headlines from numerous news services, a comprehensive reference library with materials such as online dictionaries, encyclopedias, thesauri, medical information, statistics, acronym finder, almanacs, quotations, historic documents and much more, as well as access to numerous popular search engines and much more. You will be afforded the opportunity to nominate individuals as well as be nominated for various Awards presented annually by NASET. Transition Services - with 18 main sections, comprising this is a comprehensive guide to an important element of Special Education. NASET Member's Discounts - From Board Certification in Special Education with our partner AASEP, to reduced prices from Lorman Education Services for seminars and tele-seminars, NASET can help to save you money on your continuing education needs. Other Useful Links - Links to sites of specific interest to the Special Education Community. NASET Sponsors - Special education products and services: from adaptive technology to toys for the special needs student. NASET's Book Selections at Amazon.com - A selection of books in various topics of interest to special educators. Can You Really Afford Not To Be Part of NASET? You can start taking advantage of all these member's benefits today! There are mulitple ways to join NASET, including online registration for immediate access. Take a moment to review the various membership options and registration methods. Whatever method you choose to join, we look forward to having you be part of our special education community. Remember NASET is the only national association solely dedicated to meeting the needs of you, our present and future members.